Have you ever asked yourself what's wrong with a story? 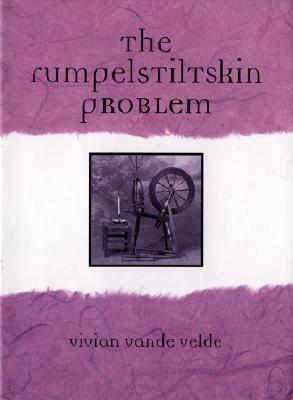 Well, Vivian Vande Velde did, and I (as well as my students) have thoroughly enjoyed the results of her ponderings. I found this small book purely by accident when I was in the library one day. I was looking for a short story to read aloud to my sixth graders in honor of "National Tell a Fairy Tale Day," when I came across this treasure. I previewed the book quickly, and the author hooked me from the very beginning. The Rumpelstiltskin Problem by Vivian Vande Velde is the author's attempt to explain how a girl ends up sitting in a room trying to spin straw into gold and why anyone would believe that she could. I mean, when you think about the story, it doesn't quite make sense how someone could end up in that kind of predicament and end up making deals with Rumpelstiltskin. The book is actually six different stories, or alternate explanations, of how the whole story came to be. In other words, nothing is as it truly seems in the fairy tale we've been told all this time. 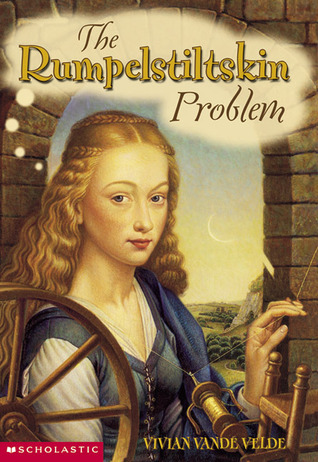 Velde creates six completely different versions of how that maiden ended up in the tower with the straw and Rumplestiltskin. I enjoyed all of the explanations. I chose two of my favorites to read aloud to my sixth gradeers over a few days. They loved them! So, you know how we often say, "Don't judge a book by its cover"? Well, we really shouldn't judge them by their size, either. While this is not a big book, it is a worthy read. I also think it makes for a great writing lesson to students. They can see how you take the same players in a story, but change their circumstances, their motives, and their reactions with a humorous result. If you like fairy tales, as I do, you should definitely read this one,...no matter what age you are. It's good for a laugh and written quite well. I hope to be back in my regular reading mode soon. Life is going by much too quickly for me lately, and I am barely keeping up. Hopefully, life will be back to normal (or close to it) in another week or so. I'm anxious to start on my next Jo Nesbo book,...now that I've unpacked almost all the moving boxes and found it!